No. 10 Stealth Belt Silverado at Eldora Speedway on Wednesday, July 19. 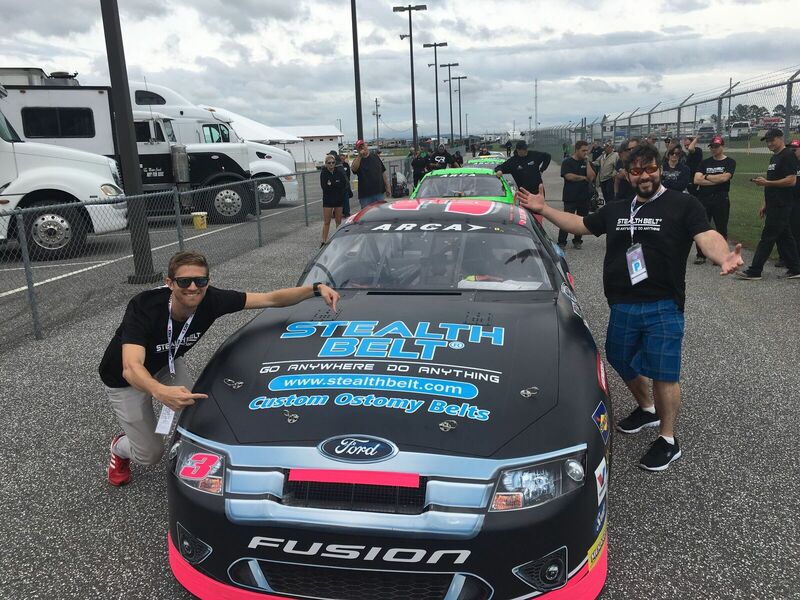 Richard O'Hamill CEO and Collin Jarvis Vice President Stealth Belt Inc.
Stealth Belt Inc. is pleased to be the official sponsor of Ray Ciccarelli #3 car in tonights ARCA Racing Series at the Talladega Super Speedway! Ray was diagnosed with Crohn’s Disease and now lives with an ostomy. Crohn’s Disease is a common but potentially life-threatening form of IBD. Ray was officially diagnosed in Jan of 2002. After 15 years of exhausting all other medical options, Ray underwent abdominal surgery and had his large intestine removed. As a result, he must now wear an ostomy bag on his side to collect bodily waste. Stealth Belt Inc. makes custom ostomy support belts that are designed to support and conceal ostomy appliances, so that those who must wear an ostomy, including Ray, are free to Go Anywhere, Do Anything! “I look forward to continuing to bring awareness to living with Crohn’s disease and with an ostomy bag in hopes that my story will encourage people like me to never give up chasing their dreams and living life to the fullest”, said Ray. Racing has been a long standing tradition in the Ciccarelli family, and Stealth Belt Inc. is proud to support Ray continue that tradition today here at the Talladega Super Speedway! For more information Contact: Stealth Belt Inc.